Story copyright © 2003 Aaron Shepard. Script copyright © 2003 Aaron Shepard. Scripts in this series are free and may be copied, shared, and performed for any noncommercial purpose, except they may not be posted online without permission. PREVIEW: When a young man seeks a wife by way of family tradition, he finds himself engaged to a mouse. NOTES: For best effect, place NARRATORS 1 and 2 at far left, and 3 and 4 at far right, as seen from the audience. In scenes between MIKKO and PRINCESS MOUSE, they can suggest their size difference if she looks up and he looks down as they face diagonally or toward the audience. Below is the tune for “The Song of the Princess Mouse,” an original composition. FARMER: Boys, you’re old enough now to marry. But in our family, we have our own way to choose a bride. BROTHER: (rudely) You’ve told us, Father. We must each cut down a tree and see where it points. FARMER: That’s right. Then walk that way till you find a sweetheart. That’s how we’ve done it, and that’s how we always will. NARRATOR 2: Now, the older son already knew who he wanted to marry. He also knew how to cut a tree so it fell how he wanted. So, his tree fell and pointed to the farm where his sweetheart lived. NARRATOR 3: The younger son, whose name was Mikko, didn’t have a sweetheart, but he thought he’d try his luck in the town. Well, maybe he cut the tree wrong, or maybe it had thoughts of its own, but it fell pointing to the forest. BROTHER: (mockingly) Good job, Mikko! What sweetheart will you find there? A wolf or a fox? MIKKO: (bristling) Never mind. I’ll find who I find. NARRATOR 1: The two young men went their ways. Mikko walked through the forest for hours without seeing a soul. But at last he came to a cottage deep in the woods. MIKKO: I knew I’d find a sweetheart! NARRATOR 4: But when he went inside, he saw no one. MIKKO: (sadly) All this way for nothing. NARRATOR 2: Mikko looked around, but the only living thing in sight was a little mouse on a table. Standing on its hind legs, it gazed at him with large, bright eyes. MIKKO: Did you say something? PRINCESS MOUSE: Of course I did! Now, why don’t you tell me your name and what you came for? NARRATOR 3: Mikko had never talked with a mouse, but he felt it only polite to reply. MIKKO: My name is Mikko, and I’ve come looking for a sweetheart. PRINCESS MOUSE: (squeals in delight) Why, Mikko, I’ll gladly be your sweetheart! MIKKO: (confused) But you’re only a mouse. PRINCESS MOUSE: That may be true, but I can still love you faithfully. Besides, even a mouse can be special! Come feel my fur. NARRATOR 1: With one finger, Mikko stroked the mouse’s back. MIKKO: (in surprise) Why, it feels like velvet! Just like the gown of a princess! PRINCESS MOUSE: That’s right, Mikko. NARRATOR 4: And as he petted her, she sang to him prettily. Mikko’s sweetheart will I be. What a fine young man is he! Like a princess fine and rare. MIKKO: (kindly) All right, little mouse, you can be my sweetheart. PRINCESS MOUSE: (happily) Oh, Mikko! I promise you won’t be sorry. NARRATOR 3: Mikko wasn’t so sure, but he just stroked her fur and smiled. NARRATOR 1: When Mikko got home, his brother was already there boasting to their father. BROTHER: My sweetheart has rosy red cheeks and long golden hair. FARMER: Sounds very nice. And what about yours, Mikko? MIKKO: Mine wears a velvet gown, like a princess! NARRATOR 2: His brother stopped laughing. FARMER: Well! It sounds like Mikko’s tree pointed a good way too! But now I must test both your sweethearts. Tomorrow you’ll ask them to weave you some cloth, then you’ll bring it home to me. That’s how we’ve done it, and that’s how we always will. NARRATOR 1: They started out early next morning. When Mikko reached the cottage in the woods, there was the little mouse on the table, jumping up and down in happiness. PRINCESS MOUSE: Oh, Mikko, I’m so glad you’re here! Is this the day of our wedding? NARRATOR 4: Mikko sighed and gently stroked her fur. MIKKO: (glumly) Not yet, little mouse. PRINCESS MOUSE: Why, Mikko, you look so sad! What’s wrong? MIKKO: My father wants you to weave some cloth. But how can you do that? You’re only a mouse! PRINCESS MOUSE: That may be true, but I’m also your sweetheart, and surely Mikko’s sweetheart can weave! But you must be tired from your walk. Why don’t you rest while I work? NARRATOR 2: Mikko lay down on a bed in the corner, and the little mouse sang him a pretty lullaby. Cloth of linen I will weave. I’ll be done when he must leave. NARRATOR 3: When the little mouse was sure that Mikko was asleep, she picked up a sleigh bell on a cord and rang it. NARRATOR 1: Out of mouseholes all around the room poured hundreds of mice. NARRATOR 4: They all stood before the table, gazing up at her. PRINCESS MOUSE: Hurry! Each of you, fetch a strand of the finest flax. NARRATOR 2: The mice rushed from the cottage. NARRATOR 3: Then one, two, three, and back they were, each with a strand of flax. NARRATOR 1: First they spun it into yarn on the spinning wheel. NARRATORS 2–4 (or OTHER MICE): Whirr. Whirr. Whirr. NARRATOR 3: some rode around with the wheel. NARRATOR 1: Then they strung the yarn on the loom and wove it into cloth. NARRATORS 2–4 (or OTHER MICE): Swish. Thunk. Swish. Thunk. Swish. Thunk. NARRATOR 3: some sailed the shuttle back and forth. NARRATOR 1: At last they cut the cloth from the loom and tucked it in a nutshell. PRINCESS: Now, off with you! NARRATOR 4: And they all scampered back to their mouseholes. PRINCESS MOUSE: (calling) Mikko, wake up! It’s time to go home! And here is something for your father. NARRATOR 2: Mikko sleepily took the nutshell. MIKKO: Thank you, little mouse. NARRATOR 1: When he got home, his brother was proudly presenting the cloth from his sweetheart. The farmer looked it over. FARMER: Strong and fairly even. Good enough for simple folks like us. And where is yours, Mikko? NARRATOR 4: Mikko blushed and handed him the nutshell. BROTHER: (scornfully) Look at that! Mikko asked for cloth, and his sweetheart gave him a nut! NARRATOR 2: But the farmer opened the nutshell and peered inside. Then he pinched at something and started to pull. Out came linen, fine beyond belief. It kept coming too, yard after yard after yard. NARRATOR 3: Mikko’s brother gaped with open mouth, and Mikko did too! FARMER: There can be no better weaver than Mikko’s sweetheart! But both your sweethearts will do just fine. Tomorrow you’ll bring them home for the wedding. That’s how we’ve done it, and that’s how we always will. NARRATOR 1: When Mikko arrived at the cottage next morning, the little mouse again jumped up and down. PRINCESS MOUSE: Oh, Mikko, is this the day of our wedding? MIKKO: (glumly) It is, little mouse. NARRATOR 4: But he sounded more glum than ever. PRINCESS MOUSE: Why, Mikko, what’s wrong? MIKKO: (blurting out in distress) How can I bring home a mouse to marry? My brother and father and all our friends and neighbors will laugh and think I’m a fool! PRINCESS MOUSE: (softly) They might think so, indeed. But, Mikko, what do you think? 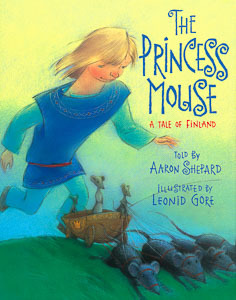 NARRATOR 2: Mikko looked at the little mouse, gazing at him so seriously with her large, bright eyes. NARRATOR 3: He thought about how she loved him and cared for him. MIKKO: (decisively) I think you’re as sweet as any sweetheart could be. So let them laugh and think what they like. Today you’ll be my bride. PRINCESS MOUSE: Oh, Mikko, you’ve made me the happiest mouse in the world! NARRATOR 1: She rang her sleigh bell, and to Mikko’s astonishment, a little carriage raced into the room. NARRATOR 4: It was made from a nutshell and pulled by four black rats. A mouse coachman sat in front, and a mouse footman behind. PRINCESS MOUSE: Mikko, aren’t you going to help me down? NARRATOR 2: Mikko lifted her from the table and set her in the carriage. The rats took off and the carriage sped from the cottage, so that Mikko had to rush to catch up. NARRATOR 3: While he hurried along behind her, the little mouse sang a pretty song. When I go to be his bride. NARRATOR 1: At last they reached the farm and then the spot for the wedding, on the bank of a lovely, swift-flowing stream. NARRATOR 4: The guests were already there enjoying themselves. But as Mikko came up, they all grew silent and stared at the little carriage. NARRATOR 2: Mikko’s brother stood with his bride, gaping in disbelief. Mikko and the little mouse went up to him. BROTHER: (loudly) That’s the stupidest thing I ever saw. NARRATOR 3: And with one quick kick, he sent the carriage, the rats, and the mice, all into the stream. Before Mikko could do a thing, the current bore them away. MIKKO: (beside himself) What have you done! You’ve killed my sweetheart! BROTHER: Are you crazy? That was only a mouse! MIKKO: (defiantly but near tears) She may have been a mouse, but she was also my sweetheart, and I really did love her! NARRATOR 1: He was about to swing at his brother, when his father called out. NARRATOR 4: All the guests were staring downstream and pointing and crying out in wonder. NARRATOR 2: Mikko turned and to his amazement saw four black horses pulling a carriage out of the stream. NARRATOR 3: A coachman sat in front and a footman behind, and inside was a soaked but lovely princess in a gown of pearly velvet. NARRATOR 1: The carriage rode up along the bank and stopped right before him. NARRATOR 4: Mikko stared blankly a moment, and then his eyes flew wide. MIKKO: Are you the little mouse? PRINCESS MOUSE: (laughing) I surely was, but no longer. A witch enchanted me, and the spell could be broken only by one brother who wanted to marry me and another who wanted to kill me. But, sweetheart, I need a change of clothes. I can’t be wet at our wedding! NARRATOR 2: And a grand wedding it was, with Mikko’s bride the wonder of all. The farmer could hardly stop looking at her. NARRATOR 3: Of course, Mikko’s brother was a bit jealous, but his own bride was really quite nice, so he couldn’t feel too bad. NARRATOR 4: but it was a cottage no longer! NARRATOR 3: and there they made their home happily. ALL: you know just how they chose their brides.